Boletus subtomentosus is sometimes referred to as the Yellow Cracking Bolete (although the cap does not always crack). An infrequent species, the Suede Bolete is found mainly under broad-leaf trees, but it does occur also on the edges of conifer plantations where birch and willow grow. Because it lacks strong features, this is a tricky bolete to identify with confidence, but a simple chemical test helps eliminate many options: the cap turns bright mahogany red if you put a spot of KOH (household ammonia is fine) onto it. An infrequent find in Britain and Ireland, this bolete occurs also in most parts of mainland Europe as well as in Asia and North America. 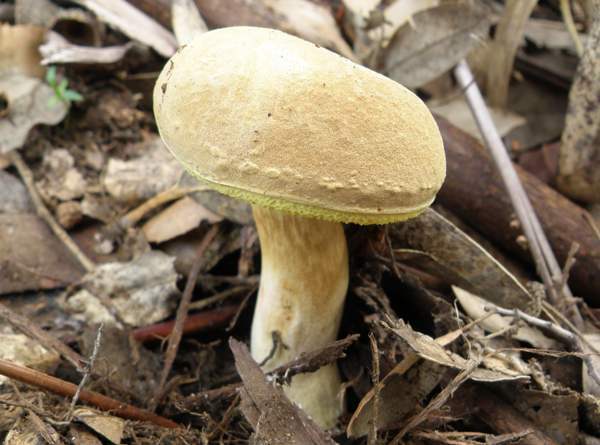 The Suede Bolete is also reported from Australia. The Suede Bolete, Boletus subtomentosus, was named and described by Carl Linnaeus in 1753, and the name has remained unchanged to this day. 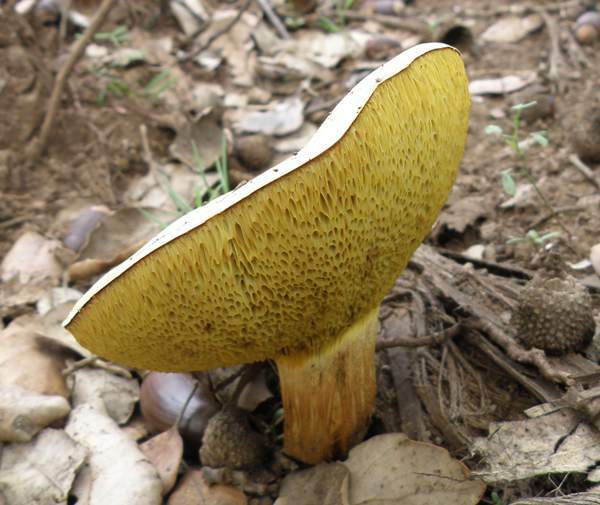 It has several synonyms, including Xerocomus subtomentosus and Ceriomyces subtomentosus, but its common names are much more interesting than the mushroom itself and include Suede Bolete, Yellow-cracked Bolete, and Boring Brown Bolete. (The latter, coined by David Arora, seems particularly apt!) Not only is cap colour a variable and therefore poor clue to the identification of this nondescript, non-delectable mushroom, but also many of its other characters are far from distinctive - for example the pores may or may not turn bluish when bruised. 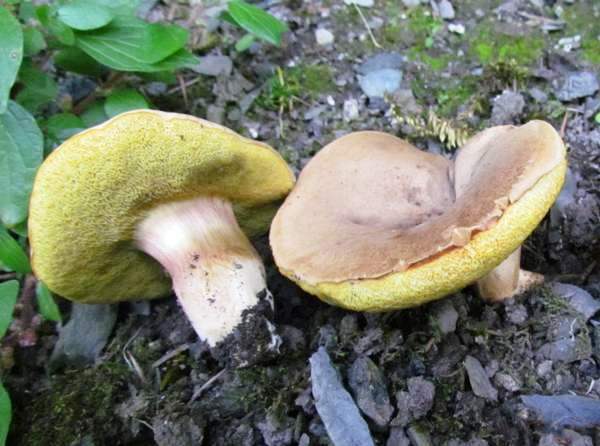 In fact I would go so far as to say that if you find a yellow-gilled bolete that seems to defy identification, its worth checking against Boletus subtomentosus as it must surely be a likely candidate. 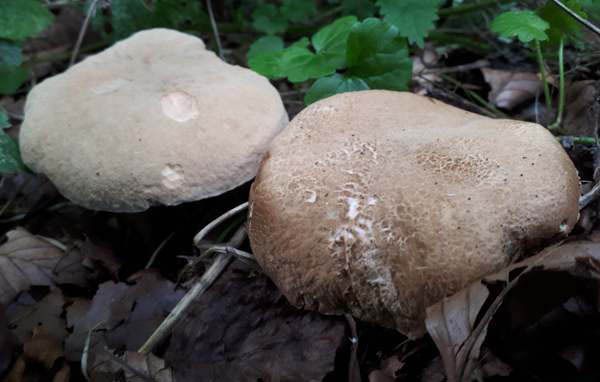 The generic name Boletus comes ​​from the Greek bolos, meaning 'lump of clay', while the specific epithet subtomentosus is a Latin word; it means 'covered with fine hairs' - downy is the single word that seems most appropriate, at least when describing fresh young caps of this bolete. 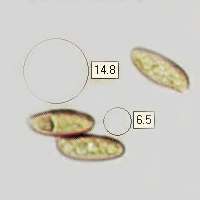 Young caps of Boletus subtomentosus are hemispherical and downy, becoming smooth and sometimes cracking as the fruiting bodies mature and revealing yellow flesh below the cuticle. 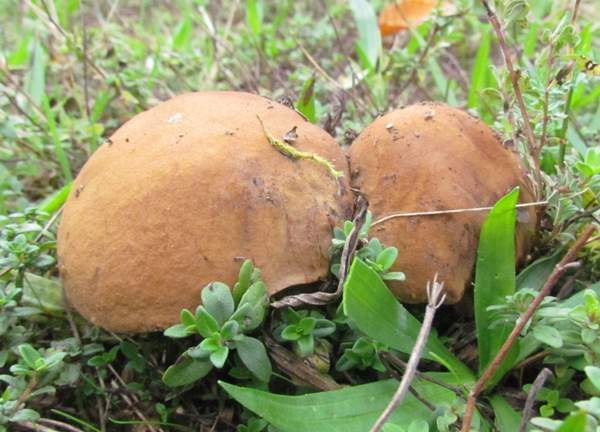 When fully expanded, the brown or olive caps of the Suede Bolete, Boletus subtomentosus, range from 4 to 8cm in diameter, often with irregular, somewhat wavy margins. 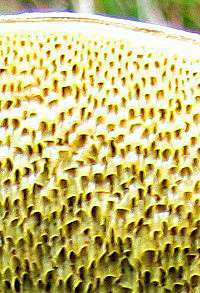 The tubes and pores of the Suede Bolete are chrome yellow, darkening with age, and the tubes have adnate attachment to the stem. When bruised the pores usually (but not in all specimens) turn blue, but the bruised area eventually becomes brownish. Pale like the cap or slightly darker, the stem is sometimes slightly bulbous at the base and usually widens again towards the cap; its cap-coloured flesh does not change colour significantly, or it flushes slightly reddish, when cut and exposed to air. 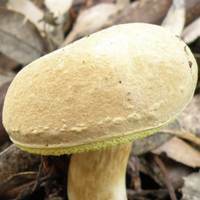 Between 1 and 2cm in diameter, the stem of the Suede Bolete is typically 4 to 8cm long. Subfusiform to ellipsoidal, smooth, 10-15 x 4-6µm.. 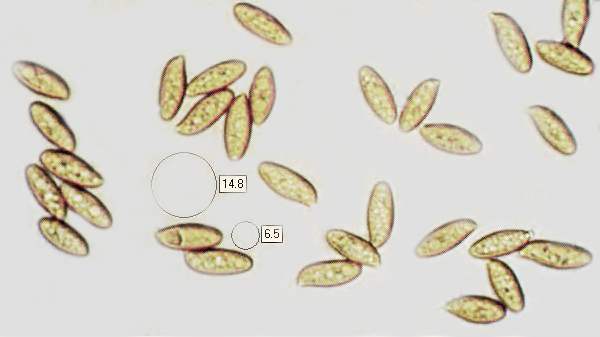 This mycorrhizal mushroom is found singly or in small groups under broadleaf trees in parks and in mixed woodland, particularly in calcareous regions. 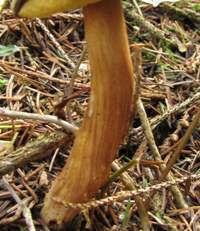 Boletus Chrysenteron has a reddish stem, usually untapered. Boletus subtomentosus is edible but not highly regarded. It is worth adding to a dish of mixed mushrooms but we have no recipes specially devised for this species. It can, like other boletes, be dried and stored for later use.